June 23, 2014, MCLEAN, VA — Corcentric, a leading provider of accounts payable automation and electronic invoicing solutions, will be co-hosting a free 1-hour Webinar with TAPN (which was recently acquired by the Institute of Finance & Management), titled “The Future of Procure to Pay.” This Webinar will take place tomorrow, Tuesday, June 24 at 2pm, EST and is designed to illustrate how closely Procurement and AP work together in today’s business environment. A collaborative relationship between the two entities is replacing the old practice of working in silos. This collaboration not only helps achieve each department’s objectives; it also contributes to the success of the business overall. 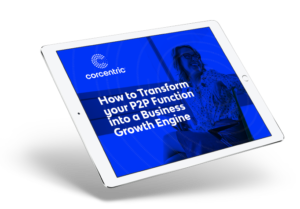 Corcentric’s Vice President of Product Marketing, Rob DeVincent, will be a presenter at the Webinar, along with David Hay, Accounts Payable and Procure-to-Pay consultant and former Director of Shared Services Business Services Outsourcing for Hewlett-Packard. Hay will focus on the top issues for CFOs in 2014 and how the top performing companies are realizing the benefits automation provides. DeVincent will track the P2P pathway, from PO requisition all the way to payment, and discuss the first steps an AP department needs to take before implementing automation. This Webinar is recommended for AP professionals who are considering automating their department and coordinating processes with procurement.